I always enjoy the month of January, which brings new energy, goal setting and much optimism for the future. I hope you’re looking forward to 2014 as well. Please don’t hesitate to let me know what I can do to support you! I am a member of the American Bar Association’s Solo, Small Firm and General Practice Division. I joined the Division to be part of the national conversation about how to improve the practice of law for solo and small firm practitioners. Over the summer, I was approached by an editor of the Division’s GP|Solo eReport, a digital magazine, and invited to write a four-part series about setting up a virtual law practice. I’m thrilled about this opportunity! I view my virtual office as a role model for how law firms can evolve past an increasingly outdated brick and mortar approach, and operate to reduce costs (and pass those savings on to clients), be more environmentally conscious, and provide excellent client service. Part One of my column is reprinted below with permission from the American Bar Association’s GPSolo eReport, and Part Two will be forthcoming in next month’s newsletter. Is a Virtual Law Practice Right for You? As I write this, I am sitting in my virtual law office—more specifically, a spare bedroom in my townhouse which has been converted into an office. My attire, admittedly, is quite casual: black running tights paired with a t-shirt. Tonight, I’m attending the annual Washington Women Lawyers dinner in downtown Seattle. I’ll need to change clothes at some point, but for now I’m quite comfortable. My cat, Roger, snoozes contentedly downstairs on the sofa. The tea kettle simmers in the kitchen. And, consistent with the stereotype of a home office, the washing machine spins away while I work. I opened my virtual law firm in 1999 after an eclectic first decade of legal work, which included five years in Washington, D.C., writing legislation for the U.S. Senate and working as a registered foreign lobbyist, and then a move to Seattle to work both in private practice and as a pro-tem magistrate. When I started my solo practice, a woman operating a law firm out of her home conjured up images of someone fitting in a few hours of work before picking up the kids at school and driving them to soccer practice. Some attorneys assumed, and a few verbalized, that my practice was not “serious” and that a home-based law practice could never survive on a long-term basis. Are there any legal constraints regarding home-based businesses that might impact your decision? To ensure that your business model is in compliance, it’s important that you check all state and local legal requirements. For example, the City of Seattle imposes various restrictions on home-based businesses in order to reduce the impact of commercial activity within residential neighborhoods, such as limiting business deliveries to one per day on weekdays. Make sure you feel comfortable with any restrictions before you proceed. I do not have children, and I live in a quiet neighborhood. My home offers sufficient space so that my office is set apart and completely dedicated to my law firm. When guests come, I don’t have to clean out my office so it can be used as a spare bedroom. If your home environment is noisy, disruptive, or does not have the capacity for you to permanently and consistently dedicate a specific room as office space, operating a successful virtual law practice becomes much more problematic. My practice focuses on business law, estate planning, and probate. Other than the occasional probate hearing, my firm does not handle litigation. A transactional practice lends itself to a virtual environment more readily than a litigation practice, due to the practicalities involved in serving and receiving pleadings, conducting discovery, etc. Happy New Year everyone! January is one of my favorite times of the year, filled with new energy, goals, dreams, and conviction. I look forward to presenting on estate planning issues at the upcoming Moneywise Women Conference, to be held on Saturday, January 19, 2013, from 9:00 a.m. to 4:00 p.m. at North Seattle Community College. These popular conferences create excellent opportunities for women to network and attend classes on a variety of financial topics including retirement planning, investing, improving your credit score, and developing a more thorough understanding of your cash flow and budgeting. For further information and to register, please contact my office or visit: www.moneywisewomen.net. In addition, on February 1st, I will be speaking at a NW Seattle PEPS group regarding estate planning issues. And on February 9th, I will once again team up with Debbie Whitlock of the Femme Finance radio show on 1150 a.m. radio, to discuss legacy and estate planning at the Northwest Chinese School. Lisa Vargo will be out on vacation through January 7th. In January, our office will be closed on the 21st in observance of the Martin Luther King Day holiday. I will be out of the office on vacation from January 22nd – January 25th. I will have limited availability during this period. Lisa will be fully available to provide assistance during this time. In addition, our office will be closed on February 18th for President’s Day. As you know, Washington recently approved Referendum 74 legalizing gay marriage. The new law took effect on December 6th. This law may impact your estate planning, particularly if you are currently in a state registered domestic partnership or if you recently got married. The Washington marital deduction for estate taxes was previously scheduled to extend to domestic partners on January 1, 2014, but will now be available immediately to all married couples regardless of gender. If you have questions, please contact my office. On January 19th, I spoke on estate planning issues at the Moneywi$e Women Conference at North Seattle Community College. These popular conferences create excellent opportunities for women to network and attend classes on a variety of financial topics including retirement planning, investing, improving your credit score, and developing a more thorough understanding of your cash flow and budgeting. The conference was well attended, and I was pleased to speak with many engaged, smart women about their estate planning concerns. Today, I spoke with a NW Seattle PEPS group regarding estate planning. I enjoy connecting with new parents, and helping ensure their families are well prepared through the nomination of guardians and establishment of testamentary trusts for their children. On February 9th, I will once again team up with Debbie Whitlock of the Femme Finance radio show (1150 am), to discuss legacy and estate planning at the Northwest Chinese School. On February 22nd, I will participate as part of a panel discussion for a Washington Bar Association continuing legal education course. We will focus on the ethics of attorneys’ use of social media. On March 8th, I look forward to teaching at a continuing legal education course for the King County Bar Association entitled “Bridging the Gap.” This course is designed to train new lawyers in basic practice areas. I will be speaking on how to advise clients on business entity selection and formation issues, as well as an overview on what it’s like to practice business law. I’m excited to help train tomorrow’s lawyers! Please note that our office will be closed on February 18th for President’s Day. In addition, I will be out of the office on vacation from March 11th through March 15th. Lisa Vargo will be available during this period. On February 1st, I spoke with a NW Seattle PEPS (“Program for Early Parent Support”) group regarding estate planning. PEPS is a wonderful group – I encourage new parents to check it out! I enjoyed chatting with new mothers, and addressing their concerns and questions to ensure their families are well prepared should the worst happen. The key issues include the nomination of guardians and establishment of testamentary trusts for their children. I encourage all new parents to work with counsel to either get a Will for the first time, or to absolutely update what they’ve done previously! On February 9th, I teamed up with Debbie Whitlock of the Femme Finance radio show (1150 am), to discuss legacy and estate planning at the Northwest Chinese School. Since the audience consisted entirely of parents, and many attendees were recent immigrants, we enjoyed working through the questions concerning how our U.S. estate planning and probate system works. On February 22nd, I participated in a panel discussion for a Washington Bar Association continuing legal education course, focusing on the ethics of attorneys’ use of social media. Some lawyers shun social media. Others use it inappropriately by degrading other lawyers and judges, or carelessly jeopardizing client confidentiality. I believe that lawyers can actively participate in social media, while employing a strong sense of professionalism and ethics! I liked being a part of this panel discussion. On March 8th, I look forward to teaching at a continuing legal education course for the King County Bar Association entitled “Bridging the Gap.” This course is designed to train new lawyers in basic practice areas. I will guide the attorneys through several mock scenarios involving business law issues to help them increase their skills in analyzing complex issues and communicating well with their clients. It’s an honor to be able to train future business lawyers! I will be out of the office on vacation from March 11th through March 15th. Lisa Vargo will be available during this period to assist you. On March 8th, I spoke at a continuing legal education course for the King County Bar Association entitled “Bridging the Gap.” This annual course trains new lawyers in basic practice areas. I focused on business law, guiding the attorneys through several mock scenarios. I wanted to help these new attorneys increase their skills in analyzing complex issues and communicating well with their clients. The audience kept raising their hands, with so many questions and comments! I felt excited to see these new lawyers be so engaged and interested in pursuing a career in business law. It’s an honor to help train them! Last Friday afternoon, I “played hooky” for a few hours and had a photo shoot with Tara Gimmer Photography. What fun! I found the location quite interesting – a former prison tucked away in the International District near Uwajimaya. (Yes, I do understand the humor of a lawyer being photographed in a prison!). The current photos on my website are five years old, and in need of being refreshed. I look forward to posting some new looks, and am greatly appreciative of Tara for her fine work! Next weekend, I’m excited to join my office for dinner at Joule in Seattle. Since we work virtually, we don’t get to actually be in the same room together very often! So we look forward to enjoying some face time, and hopefully some good food as well. I will be out of the office on vacation from May 6th through May 10th. Lisa Vargo will be available to assist you, although Lisa will be out on May 10th as well. In addition, our office will be closed on May 27th for the Memorial Day holiday. On April 6, my office enjoyed a fun dinner at Joule in Fremont! Our core team, including Lisa Vargo, Andrea Logan and Kristen Larsen, takes pride in our set up as a virtual law firm with digital files. In addition to providing work autonomy for us, it benefits our clients through its efficiency and resulting cost savings – which reduces fees. However, I must confess, I enjoy seeing my team in person once in awhile! We had a wonderful time catching up. And Joule’s modern Korean cuisine was both creative and yummy! On a less positive note, in April my desktop computer “blew up” with an audible pop, also taking out a monitor in the process. This mishap served as a great reminder for me, and hopefully all of you (especially my business clients!) to both continually back up your data and have a plan in place to cover these sorts of technology problems. With my laptop serving for a few days as a desktop substitute, and all of our client information fully backed up by Carbonite, I lost no data and minimal time as result of the mishap. Thank goodness! On June 18th, I’m excited to participate for the seventh time as a panelist for the Washington State Bar Association’s (WSBA) continuing legal education program “Lincoln on Professionalism” in Seattle. The program focuses on ethical issues faced by Abraham Lincoln in his law practice, and teaches attorneys how Lincoln’s straightforward, practical values regarding ethics and professionalism still apply today. It’s an inspiring program, and I’m always grateful to participate. As a Board member of Tennis Outreach Programs, I ask that you consider donating as part of the Seattle Foundation’s “Give Big” program on May 15th! Please see the additional information provided, and thanks in advance for your support! I will be out of the office on vacation from May 6th through May 10th. Lisa Vargo will be available to assist you, although Lisa will be out on May 10th as well. In addition, our office will be closed on May 27th for the Memorial Day holiday. In June, I will be out June 3rd – June 7th, with Lisa serving as back up! On June 18th, I’m excited to participate for the seventh time as a panelist for the Washington State Bar Association’s (WSBA) continuing legal education program “Lincoln on Professionalism” in Seattle. The program focuses on ethical issues faced by Abraham Lincoln in his law practice, and teaches attorneys how Lincoln’s straightforward, practical values regarding ethics and professionalism still apply today. Fellow panelists include King County Superior Court Judge Catherine Schaffer, WSBA Professional Responsibility Counsel Jeanne Marie Clavere, David Leroy (the former Attorney General and Lt. Governor of Idaho), and Frank Williams (a former Chief Justice of the Rhode Island Supreme Court). Both Mr. Leroy and Judge Williams are Lincoln scholars, who add much historical context to the panel. It’s an inspiring program, and I’m always grateful to participate! I’m happy to announce that last week I was elected to be on the Executive Board of Tennis Outreach Programs. As many of you know, I played junior tennis, and was ranked sectionally in our Intermountain Section (Idaho, Wyoming, Montana, Colorado, Nevada and Utah). I then went on to play college tennis for Idaho State University. Tennis taught me focus, grit, competitiveness, sportsmanship, and the value of a high work ethic. Tennis Outreach Programs creates similar learning opportunities for children by giving them a safe environment to learn tennis fundamentals, receive mentorship, and do their homework. No child is turned away from our programs due to a lack of financial resources. We have summer programs available, so please let me know if you have children who might be interested in signing up! I will be out of the office on vacation from June 3rd – June 7th. Lisa Vargo will be able to assist you during this time. Lisa, in turn, will be out of the office from June 28th through July 22nd for her annual vacation to Idaho! I will be out of the office after Lisa returns, July 29th through August 2nd. June was certainly a newsworthy month from an estate planning and business law standpoint! On June 10th, the Seattle City Council voted unanimously to limit the ability of employers to make inquiries regarding a job applicant’s criminal record. In addition, on June 13th Governor Inslee signed “emergency legislation” regarding our Washington estate tax which overrules a Washington Supreme Court decision known as “Bracken,” increases the estate tax rates to a top rate of 20%, and provides a qualifying small business deduction. Please let me know if you have questions regarding either of these topics! On June 18th, I participated for the seventh time as a panelist for the Washington State Bar Association’s (WSBA) continuing legal education program “Lincoln on Professionalism” in Seattle. The program focuses on ethical issues faced by Abraham Lincoln in his law practice, and teaches attorneys how Lincoln’s straightforward, practical values regarding ethics and professionalism still apply today. Fellow panelists include King County Superior Court Judge Catherine Schaffer, WSBA Professional Responsibility Counsel Jeanne Marie Clavere, David Leroy (the former Attorney General and Lt. Governor of Idaho), and Frank Williams (a former Chief Justice of the Rhode Island Supreme Court). Both Mr. Leroy and Judge Williams are Lincoln scholars. Thanks so much to all of you who donated to Tennis Outreach Programs (TOPs) during the Seattle Foundation’s Big Give campaign last month! We did well. I’m proud to serve on the Executive Board of TOPs. I’m also pleased to announce that Bartell Drugs is now including TOPs as part of its “B” Caring Card program, in which 4% of your purchase amount can be contributed to various non-profit organizations. So please be sure to shop at Bartell’s, use your “B” card, and designate TOPs as your non-profit of choice! Lisa Vargo will be out of the office from June 28th through July 22nd for her annual vacation to Idaho. I will be out of the office after Lisa returns, July 29th through August 2nd. Hello, and happy summer! I hope you all are enjoying our spectacular Seattle summer weather. On August 8, I will again be teaching a continuing legal education course (“CLE”) as part of the Washington State Bar Association’s (WSBA) annual readmission program. This CLE is mandatory for attorneys who were once members of the Washington Bar, had their licenses lapse for a various reasons, and now seek to be readmitted to practice. I will be joining Jeanne Marie Clavere, Professional Responsibility Counsel of the WSBA, to discuss how our ethical rules, known as the Rules of Professional Conduct, govern lawyers’ participation in social media. As many of you know, I am fairly active on Twitter, LinkedIn and Facebook. I enjoy connecting with many of you! Our ethical rules require that professional conduct and protection of client confidentialities also apply to an attorney’s on-line communications and behavior. I’m honored to help train lawyers on these aspects of our ethical rules. On September 28, 2013, I look forward to speaking once again at the U.S. Small Business Administration’s annual “Biz Fair”! I’ve volunteered for Biz Fair for years by teaching classes on the basics of business law. The entrepreneurs who participate are enthusiastic, engaged, and high energy! For more information, please visit: www.bizfair.org/. As a member of the Executive Board of Tennis Outreach Programs, I’d greatly appreciate it if you would donate an auction item, big or small, for our November 1st auction! For more information, please contact me. I will be out of the office on vacation September 2nd (Labor Day) through September 6th, and also on my birthday (September 25th). During this period, Lisa Vargo, Of Counsel, will be available to assist you. Lisa can be reached at lisa@staceyromberg.com. I will also be available on a limited basis. Hello everyone! I hope you all enjoyed a wonderful Labor Day holiday. On August 8, I taught a continuing legal education course (“CLE”) as part of the Washington State Bar Association’s (WSBA) annual readmission program. This CLE is mandatory for attorneys who were once members of the Washington Bar, had their licenses lapse for various reasons, and now seek to be readmitted to practice. Specifically, I teamed with Jeanne Marie Clavere, Professional Responsibility Counsel of the WSBA, to discuss how our ethical rules, known as the Rules of Professional Conduct, govern lawyers’ participation in social media. I’m continually honored to help train lawyers on our ethical rules. On September 8th, I will celebrate the 14th anniversary of starting my own law practice. Thanks so much to all of you for your support, for being such wonderful clients, and for making these years so fun! On September 28, 2013, I look forward to speaking once again at the U.S. Small Business Administration’s annual “Biz Fair”! I’ve volunteered for Biz Fair for years by teaching classes on the basics of business law. The entrepreneurs who participate are enthusiastic, engaged, and high energy! For more information, please visit: http://www.bizfair.org/. As a member of the Executive Board of Tennis Outreach Programs (“TOPs”), I’d be pleased if you’re able to attend our November 1st evening of tennis, dinner, and silent and live auctions at the Eastside Tennis Center! It will be hosted by King 5’s John Curley. Please contact me if you’re interested in coming, and/or learning more about TOPs! I will be out of the office on vacation through September 6th, and also on my birthday (September 25th). During this period, Lisa Vargo, Of Counsel, will be available to assist you. Lisa can be reached at lisa@staceyromberg.com. I will also be available on a limited basis. Happy October, and welcome to the Inaugural Issue of our newsletter. I hope that you find it interesting and informative. I’ll cover legal issues related to business law, estate planning and probate, as well as occasional news about my office. “A trustee shall administer the trust solely in the interests of the beneficiaries.” -RCW 11.98.078(1). Non-professional fiduciaries serving as personal representatives or trustees often assume their new duties with apprehension. How much time will it take? Will the work be difficult? What if estate heirs or trust beneficiaries start fighting? This article offers 10 straightforward strategies to help you tackle your fiduciary duties in an efficient, legally sound an effective way. Washington law requires personal representatives, prior to appointment by the court, to “take an oath, … that the duties of the trust as personal representative will be performed according to law.” Similarly, RCW 11.98.078(1) provides, “A trustee shall administer the trust solely in the interests of the beneficiaries.” Serving as a fiduciary is serious business. If you commit errors, fail to promptly fulfill your obligations or engage in inappropriate conduct, you may find yourself in court attempting to justify your misdeeds before a judge, opposing counsel, and disgruntled heirs and beneficiaries. Hello, and Happy Thanksgiving! Thanksgiving is my favorite holiday of the year because it focuses on gratitude – and, of course, food! I hope all of you enjoy a safe, peaceful and fun holiday. As many of you know, I serve on the Board of Directors for Tennis Outreach Programs (“TOPs”). We’re a Washington non-profit, and operate the Eastside Tennis Center in Kirkland. Our mission is empowering youth for lifetime success through tennis, education, fitness and character development regardless of economic circumstances. 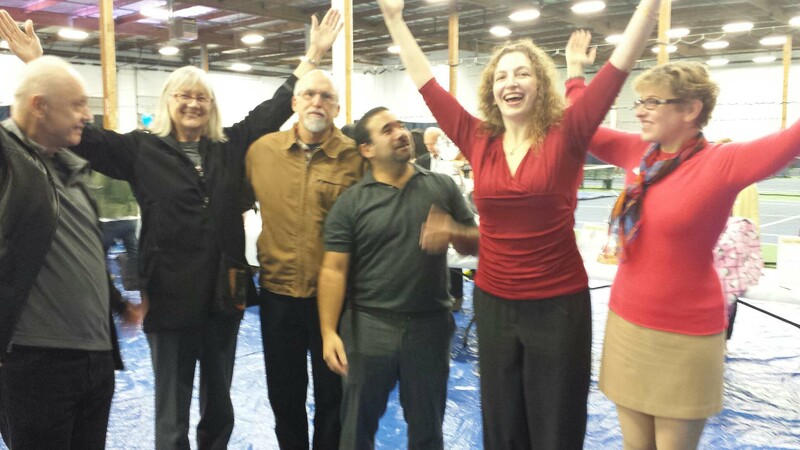 We had our annual Auction on November 1st, and it was a big success! My office team of Lisa Vargo, Andrea Logan and Kristen Larsen joined in the effort. We appreciated the opportunity to enjoy ourselves while supporting a compelling cause. October’s newsletter reprinted some tips, from an article I recently wrote, for ways to reduce fees and hassles while serving as Trustee or an Executor of an estate. Part Two is reprinted below with permission from King County Bar Association. Additional tips will be forthcoming in next month’s newsletter. We had a GREAT time at the TOPs auction! A few fellow YMCA members joined me in making the “Y” sign & promoting our love of the Y & TOPs! As the year draws to a close, I’m especially grateful to all of you, my clients and colleagues, for your business and support. I’m so fortunate to be able to do what I love each day, and associate with people of such kindness, wisdom and integrity! Thank you. My October and November newsletters both reprinted tips from an article I recently wrote, discussing ways to reduce fees and hassles while serving as a Trustee or an executor of an estate. Part Three, the final installment, is reprinted below with permission from King County Bar Association. Never commingle trust or estate assets with your own assets. Immediately upon your appointment as a trustee or personal representative, work with your attorney to obtain a federal tax identification number for the trust or estate and open a separate bank account. If you expend your own funds on behalf of the estate or trust, be certain you have all your receipts and can fully support any reimbursements. You can purchase this helpful resource for a nominal fee from the Estate Planning Council of Seattle. Please enjoy a happy, safe and warm holiday season! Happy New Year! I always particularly enjoy this time of year, which to me represents energy, setting new goals and optimism for the future. I hope you feel similar passion for 2012. I’m ready to partner with you as you achieve your goals, so please keep me posted and don’t hesitate to ask if I can help! For your review here is a copy of my article, “Following Lincoln’s Example of Professionalism.” It was published in the December issue of the King County Bar Association’s Bar Bulletin. As many of you know, I’m a Lincoln fan! I enjoy learning about the talents and integrity he brought to his law practice as well as the presidency. In particular, I find Lincoln’s relationship with his co-counsel and later Secretary of War Edwin Stanton remarkable, and worthy of study. What do you think? Please let me know. I’d love to hear from you. On January 17th, I am excited to partner with Debbie Whitlock of Sound Financial Partners and host of the Femme Finance radio program on the CBS Radio Network for a WBO (Women Business Owners) event entitled, “Your Family – Your Business – Your Legacy: Dying with Clarity in a Culture of Denial.” Our one hour presentation, which will be held at the Karmen Executive Center in Bellevue, will focus on key issues for business owners to get their “house in order,” including estate planning, business succession and insurance. If interested, please contact my office or WBO for more details (http://womenbusinessowners.org/). On February 9th, I look forward to again presenting with Debbie Whitlock to the parent’s group at Holy Rosary School in West Seattle. More details to follow! Please note that our office will be closed on January 16th (Martin Luther King Day) and January 23rd – 27th (winter vacation). In February, our office will be closed on February 10th for a vacation day, and on February 20th for President’s Day. Hello, and happy February! I sincerely hope that 2012 has started off with a renewed energy and passion for all of you. My January started 2012 off well! On January 17th, I teamed up with Debbie Whitlock of Sound Financial Partners and host of the Femme Finance radio program on the CBS Radio Network for an event sponsored by Women Business Owners entitled, “Your Family – Your Business – Your Legacy: Dying with Clarity in a Culture of Denial.” We discussed key issues for business owners to get their “house in order,” including estate planning, business succession and insurance. On February 9th, I look forward to again presenting with Debbie Whitlock. We’ll be speaking to the parent’s group at Holy Rosary School in West Seattle. We plan to address parents’ questions and concerns about estate planning, setting up testamentary trusts for their children, the need to name a guardian in their Will, and how life insurance takes on a special significance for parents. On February 24th, I’ll be speaking at a continuing legal education course sponsored by the Washington State Bar Association entitled, “The Small Firm in Today’s World.” I’m grateful to all my clients for choosing to work with my small law firm! I strongly believe that attorneys practicing law in small firms spend less time on bureaucracy, less money on overhead, and in turn provide more efficient and affordable work for our clients! I look forward to supporting this event. Please note that our office will be closed on February 20th for President’s Day. In March, I will be out on vacation from March 12th – 16th. Please let me know what I can do to help you meet your goals this month! It’s hard to believe it’s already March. February flew by. I truly enjoyed working with all of you last month! In addition, I had fun giving two presentations. On February 9th, I partnered with Debbie Whitlock (President of Sound Financial Partners, and host of the Femme Finance radio program on the CBS Radio Network) to speak to the parent’s group at Holy Rosary School in West Seattle. We spoke about issues directly impacting parents, including setting up testamentary trusts for their children, tackling the sometimes tricky issue of naming a guardian, and establishing a temporary caregiver for children in a General Durable Power of Attorney in the event of incapacity. On February 24th, I spoke at a continuing legal education course sponsored by the Washington State Bar Association entitled, “The Small Firm in Today’s World.” I enjoyed participating in this event, and supporting other practitioners in solo and small law firms. On April 24th, I’m looking forward to being a panelist for the Washington State Bar Association’s (WSBA) continuing legal education program “Lincoln on Professionalism,” be held in the WSBA’s conference center in downtown, Seattle. This program focuses on ethical issues faced by Abraham Lincoln in his law practice, and teaches attorneys how Lincoln’s straightforward, practical values regarding ethics and professionalism still apply today. I’ve participated in these programs four times previously, and am excited to have been invited back once again! For more information, please contact my office or visit www.wsba.org. Please note that our office will be closed on March 12th – 16th for vacation. On April 24th, I look forward to participating as a panelist for the Washington State Bar Association’s (WSBA) continuing legal education program “Lincoln on Professionalism” to be held in the WSBA’s conference center in downtown, Seattle. This program focuses on ethical issues faced by Abraham Lincoln in his law practice, and teaches attorneys how Lincoln’s straightforward, practical values regarding ethics and professionalism still apply today. I’ve participated in these programs four times previously, and am excited to have been invited back once again! For more information, please contact my office or visit www.wsba.org. Please note that our office will be closed on May 28th – June 1st for vacation. Happy May Day! I hope all of you are enjoying spring, and looking forward to a fun and productive summer. On April 24th, I again participated as a panelist for the Washington State Bar Association’s (WSBA) continuing legal education program “Lincoln on Professionalism.” This program focuses on ethical issues faced by Abraham Lincoln in his law practice, and teaches attorneys how Lincoln’s straightforward, practical values regarding ethics and professionalism still apply today. To give you a flavor of the event, some of the questions I tackled as a panelist included, “How can we be tenacious and persistent on behalf of our clients, without being self-righteous?” and “Do you think in this day and age that a lawyer can be an effective advocate while demonstrating courtesy and goodwill?” Tough questions! What do you think? I continually drew from my 24 years of experience in addressing these issues, and, more importantly, in striking the best note possible for the effectiveness of my own advocacy on a daily basis. Lincoln proved masterful at finding the right balance between persuasively arguing his client’s case to achieve best results, while avoiding going over the line into the overly aggressive behavior that a few lawyers engage in – behavior that unfortunately taints us all. I find, when in doubt, if I try to model Lincoln’s behavior, I’ve chosen correctly! Please note that our office will be closed on May 28th – June 1st, and July 2nd – 6th for vacation. I’m excited to announce that I’m now serving on the Board of Directors for Tennis Outreach Programs (“TOPS”). TOPs, a nonprofit organization founded in 2003, designs and offers affordable tennis programs and a safe place to learn for underserved and at-risk youth in our community. By introducing tennis to our youth, TOPS introduces kids to a sport that they can play for their lifetime and promotes fitness in an engaging and entertaining way. The game of tennis teaches sportsmanship, confidence, teamwork and builds positive relationships — all valuable lifelong skills that go well beyond the court. For at-risk youth, these skills can provide the edge to achieve a successful life. As a former sectionally ranked junior and college player, I strongly supports TOPS’s mission. For more information, please visit TOPS’s website at: www.tennisoutreach.org. On July 19th, I look forward to speaking at the 7th Annual Washington State Bar Association’s Solo and Small Firm Conference: Reinvent, Recharge and Rejuvenate Your Practice! This continuing legal education course will be held in Ocean Shores, Washington. Due to my participation in this conference, I will be out of the office on July 18th and 19th. For more information, please contact my office or visit the Bar’s website at www.wsba.org. Please note that our office will be closed on July 2nd – 6th for vacation. Happy summer! Please note that my office is closed this week for vacation. On a personal note, I enjoyed my trip to Boise last month to attend my nephew’s wedding. I’m originally from Boise, so it was fun to take in the sunshine, catch up with old friends and see all the growth and change of my home town! When I’m on vacation, I am able to fully access e-mail and our office’s digital files. Thankfully, I can work nearly as effectively in a hotel as in my home office! On July 19th, I look forward to speaking at the 7th Annual Washington State Bar Association’s Solo and Small Firm Conference: Reinvent, Recharge and Rejuvenate Your Practice! This continuing legal education course will be held in Ocean Shores, Washington. I’m a strong supporter of lawyers practicing in small firms because lawyers generally find more work satisfaction (I know I have! ), and it also provides valuable cost savings and personalized service to clients. I’m always pleased to be asked to speak at these events, and to support Washington’s vibrant legal community of solo and small practitioners! Due to my participation in this conference, I will be out of the office on July 18th and 19th. For more information, please contact my office or visit the Bar’s website at www.wsba.org. Please read my most recent article: “Develop Your Game Plan: Building Meaningful Professional Connections”, which was published in the June issue of the King County Bar Bulletin. Most of us, at least sometimes, find it challenging to meet new people in unfamiliar environments. By preparing in advance, and focusing on developing relationships rather than promoting yourself, you may actually find yourself having fun at that event you initially dreaded! On July 19th, I enjoyed speaking at the 7th Annual Washington State Bar Association’s Solo and Small Firm Conference: Reinvent, Recharge and Rejuvenate Your Practice! This continuing legal education course was held in Ocean Shores, Washington. I found it inspiring to collaborate with other solo and small law firm practitioners, who also want to increase their professionalism, quality of work product, and enjoyment of their practices. On July 23rd, I teamed up with Debbie Whitlock of Sound Financial Partners to speak at the Ballard PEPS groups (Program for Early Parent Support) about estate planning issues. These new mothers came prepared, and asked thoughtful questions about setting up testamentary trusts for their children within their Wills, choosing a guardian, and utilizing their General Durable Power of Attorneys to make sure that someone is authorized to care for their children in the event that both parents are incapacitated. I enjoyed our discussion, and appreciated their invitation! Please note that Lisa Vargo will be out of the office visiting family in Idaho until August 21st. During this time, Lisa’s availability will be limited. If you are working with Lisa regarding a matter, please feel free to contact me directly. Additionally, I will be out of the office September 3rd – 7th for a Labor Day vacation. Finally, it’s time to vote in our Washington primary election! Both Lisa and I worked for Bruce Hilyer while he was in private practice, before he became a King County Superior Court Judge. Lisa and I learned much from Bruce’s high integrity, good client service, and outstanding legal skills. Since Bruce became a judge, he has received high marks both from other lawyers and the King County Bar Association. We enthusiastically recommend Bruce, and encourage you to vote for him for our Washington Supreme Court! For more information, please ask either Lisa or me, or visit Bruce’s website at: http://judgehilyerforjustice.com/. Please note that my office will be closed for our summer vacation from September 3rd – 7th. During this period, Lisa Vargo, Of Counsel, will be available to assist you as needed. Lisa can be reached at lisa@staceyromberg.com or at 206-595-4816. I will also be available on a limited basis. September 8th is the 13th Anniversary of starting my own law practice! Thanks so much to all of you for your support, for being such wonderful clients, and for making these years so much fun! On September 27th, I look forward to participating for the sixth time as a panelist for the Washington State Bar Association’s (WSBA) continuing legal education program “Lincoln on Professionalism” to be held in the WSBA’s conference center in downtown, Seattle. As you can surmise, this seminar has been a hit and that is why it has been repeated so many times. The program focuses on ethical issues faced by Abraham Lincoln in his law practice, and teaches attorneys how Lincoln’s straightforward, practical values regarding ethics and professionalism still apply today. I continue to be excited to be invited back once again! I’m also enthused because one of my fellow panelists will be The Honorable Frank J. Williams, Chief Justice (retired) of the Rhode Island Supreme Court. For more information, please contact my office or visit www.wsba.org. Seattle’s Sick and Safe Leave Ordinance becomes effective today! We’ve sent out a separate letter to our business clients explaining the impact of this new requirement. If you’d like assistance to ensure you’re in compliance, please feel free to contact my office. On September 27th, I participated for the sixth time as a panelist for the Washington State Bar Association’s (WSBA) continuing legal education program “Lincoln on Professionalism” in Seattle. As you can surmise, this seminar has been a hit! That is why it has been repeated so many times. The program focuses on ethical issues faced by Abraham Lincoln in his law practice, and teaches attorneys how Lincoln’s straightforward, practical values regarding ethics and professionalism still apply today. For this program, our panel was enhanced by the participation of Honorable Justice Frank Williams, the former Chief Justice of the Rhode Island Supreme Court. Justice Williams and I focused on questions involving dignity and civility, qualities exemplified by Lincoln in his law practice. I’m quite grateful for the opportunity to participate, and find that I continually learn from this experience and feel inspired! On September 29th, I once again volunteered at the U.S. Small Business Administration (SBA) program, “Biz Fair.” Biz Fair is a free event, allowing future business owners to attend a variety of courses to help them launch their new enterprises. I taught four classes for budding entrepreneurs, focusing on a variety of legal issues including choosing a business entity, contracts, and commercial leases. The enthusiasm of the participants is contagious! For more information about the Biz Fair program, please see: www.bizfair.org. As many of you know, I serve on the Board of Directors for Tennis Outreach Programs. Our 2012 tennis party and auction will be held on November 3rd. Our entire office is excited to attend! If you’d like to come, I’d love to see you join me in supporting the kids. For more information, please see: www.topskirkland.org or call my office. In November, I will be out of the office from November 5th – 9th, and also from November 19th – 23rd (Thanksgiving). I will have limited availability during this period. Lisa Vargo, Of Counsel for my office, will be fully available to provide assistance except for the Thanksgiving holiday. On November 2nd, I’m excited to team up with Richard Furman, an attorney with Aiken, St. Louis & Siljeg, P.S. in Seattle, to present at the Washington State Bar Association’s 57th Annual Estate Planning Seminar. This seminar has historically enjoyed the highest attendance of any continuing legal education program sponsored by the Bar. Richard and I will be speaking on “TEDRA: A Panacea for Curing Trust & Estate Ailments.” TEDRA, Washington’s Trust and Estates Disputes Resolution Act, is a truly ground-breaking statute that places Washington at the forefront of efforts to resolve estate-related disputes in an efficient, cost-effective manner. For example, if you have an irrevocable trust that no longer serves its purpose, you may not be stuck with it. TEDRA can be used to revoke the trust. Or, in a probate setting involving a nasty, protracted family battle, TEDRA can be used to settle the matter expeditiously through either a TEDRA “Non-Judicial Dispute Resolution Agreement,” or through TEDRA mediation or arbitration proceedings. Our hourly rates will increase beginning in January 2013. It’s been four years since our last rate increase, and insurance and other costs have significantly increased. Our attorney hourly rate will be increased from $250.00 per hour to $270.00 per hour, which remains a very affordable rate in the Seattle market for attorneys with over twenty years of experience. Our paralegal rates will increase from $125.00 per hour to $130.00 per hour. If you have any questions or concerns about the 2013 rate change, please do not hesitate to contact our office. In November, I will be out of the office from November 5th – 12th, and also from November 19th – 23rd (Thanksgiving). I will have limited availability during this period. Lisa Vargo, Of Counsel for my office, will be fully available to provide assistance except for the Thanksgiving holiday. On November 2nd, Richard Furman, an attorney with Aiken, St. Louis & Siljeg, P.S. in Seattle, and I spoke at the Washington State Bar Association’s 57th Annual Estate Planning Seminar. Our topic was “TEDRA: A Panacea for Curing Trust & Estate Ailments.” TEDRA, Washington’s Trust and Estates Disputes Resolution Act, is a truly ground-breaking statute that places Washington at the forefront of efforts to resolve estate-related disputes in an efficient, cost-effective manner. I enjoyed teaching at the fall seminar, which was attended by over 800 estate planning lawyers from throughout the Pacific Northwest. I look forward to presenting on estate planning issues at the upcoming Moneywise Women Conference, to be held on Saturday, January 19, 2013 at North Seattle Community College. These popular conferences create excellent opportunities for women to network and attend classes on a variety of financial topics. For further information and to register, please visit: www.moneywisewomen.net. Please note that our office will be closed on December 25th and January 1st for the holidays. Lisa Vargo will be out on vacation from December 31st through January 7th. In January, our office will be closed on the 21st in observance of the Martin Luther King Day holiday. I will be out of the office on vacation from January 22nd – January 25th. I will have limited availability during this period. Lisa will be fully available to provide assistance during this time. I understand that the holidays are an especially hectic time. However, I hope that you’ll include paying the enclosed bill in the things you’ll do before the end of this year. Remember, for businesses, legal expenses paid by the end of 2012 will be considered a deductible expense for purposes of calculating your final 2012 federal income tax liability. Thank you, and please have a happy, safe and warm holiday season!